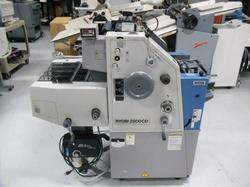 We are an engaged in offering a wide range of Ryobi 2800 CD Mini Offset Machines. This machine is widely used by offset printers providing services like printing letterheads, pamphlets etc. Based on quality performance & techniques, these machines help in providing high resolution printing with clear impressions. Looking for STOCK LIST OF OFFSET PRINTING MACHINE ?